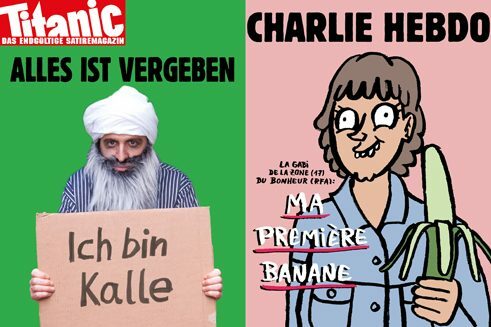 Writers and artists from the “Titanic” and “Charlie Hebdo” satire magazines came together at the “ultimate intercultural good will satire massacre”, where French and German satirists sharpened their quills for a conversation on satire and security, and the French sense of humour. In January 2015, the Western world held its breath as armed Islamists stormed the offices of Charlie Hebdo. The ensuing blood bath catapulted the name of the once relatively unknown French satire magazine into the headlines, and “Je suis Charlie” was on everyone’s lips as a wave of solidarity poured in. The first German edition of Charlie Hebdo with caricatures created by a German-speaking team of graphic artists came out in December 2016. But it strives not to be too German: all the articles are translations from the French, and the German editorial team shares office space with its big brother in Paris. How is the German edition linked to the attack in Paris? The solidarity expressed by Germans in the aftermath of the attack provided the impetus for a German edition. The “Je suis Charlie” movement was so strong in Germany that editors saw it as an opportunity to expand the magazine’s readership, Charlie Hebdo Deutschland cartoonist Teresa Habild explained. This sense of solidarity translated into real sales as well: before the attack, only around 1,000 copies were sold in Germany each week, while the “Survivor’s Issue” sold over 70,000. But are we really safe here at this sold-out event? How did the attack on their French counterparts affect the “Titanic” editorial team? Since the Charlie Hebdo massacre, the Titanic editors have known exactly how it feels to be under police protection. A team of police officers safeguarded the editorial staff for over a year, with two officers armed with machine guns stationed right outside the front entrance at the beginning. “There was a dentist in our building who asked if maybe the protection detail could lose the machine guns, since going to the dentist is scary enough on its own,” Oliver Maria Schmitt recalled. Did it raise the “Titanic”’s profile? It attracted enormous attention, at least in the early days, which was a real learning experience for Tim Wolff: “I had never been that kind of situation before. I gave hundreds of interviews in which I subtly tried to pass on two messages using an old coward’s trick: First, the police are a pretty ok bunch of guys (please protect us). Second, Muslims have a great sense of humour, really they do (please don’t kill us).” His Tweet, “If you shoot at a satirist, you only make our work more relevant”, dominated second place on the Twitter charts for a while. Did being in the spotlight change anything? Do the German and French satirists work together? What typifies the French sense of humour? Every October, Frankfurt welcomes the most important event for books, literature and publishing in the world – the Frankfurt Book Fair. Each year, one country is asked to present its culture and literature in a special pavilion, and France is the honoured guest at the 2017 fair. The entire city holds various readings and events in connection to the fair, including the satire reading organized by the Titanic editorial office. Eva-Maria Verfürth is a freelance editor and journalist.